[The USS ‘crisis’] is the result of the misrepresentation of the finances of the USS, and the desire of a new breed of university managements to cut their pension liabilities and thereby ease the financing of new buildings and campuses. Much of this argument will be familiar to colleagues. The debate about the University Superannuation Scheme (USS) deficit has been an active subject of discussion on campuses since last summer when the press first announced that the pension scheme was at risk. Initial press claims were of a deficit of £17.5bn, while at exactly the same time USS themselves reassured pensioners that the scheme was in surplus. But it is worth considering the source of this deficit in more detail than the Guardian letter’s pages will permit. Is the deficit real, as the employers and USS themselves have asserted, or is it an accounting artefact, as the UCU trade union has claimed? In September 2017, approximately one-eighth of the research-active staff were sent letters warning that their positions might be in danger, including the invocation of Capability proceedings to remove them from their jobs. This represents an alarming increase in the use of Capability at Essex. It is evidence not of individual failure of academics but a system that creates failure. As the eminent sociologist C. Wright Mills argued, if there are 1-2 people unemployed in a city, we may look to their individual psychology for answers, but if it is 5-10% of the population, then it is a social not an individual problem. To be submitted to the Guardian. As staff across UK universities we are appalled at the proposed staffing cuts at the University of Manchester (Guardian, 13.05.17) including but not limited to the School of Arts, Languages and Cultures, the Faculty of Biology, Medicine and Health, and Alliance Manchester Business School. The proposals meant that 171 members of staff are set to be axed despite annual income from tuition fees exceeding £423 million (2015/16). The way in which these cuts are being made and the treatment of these committed teachers and respected scholars is abhorrent. Unfortunately these plans are resonant of a Higher Education system now rooted in the market and underpinned by rampant managerialism that has little interest in critical public and inclusive education and a general disregard for the views or experience of academic staff. At the same time as cutting 171 jobs, the University plan to create 100+ posts for early-career academics. In our experience these positions are unlikely to offer security in contractual terms or opportunities to pursue scholarship. In the context of Manchester University’s plans and our own current experience in universities, the necessity for a government committed to an alternative model of higher, further and adult education which will abandon a system based upon crude market competition and league tables, and abolish student fees and debts has never been more urgent. There was much rejoicing back in January when the government was defeated over the first amendment to the Higher Education and Research Bill to be put to the vote in the House of Lords. That amendment introduced a definition of the functions of UK universities into the text of the bill which included their freedom “to act as critics of government and the conscience of society”. Its effects were dispersed and diffused in subsequent re-wordings, but it was the first of several major amendments to command support in the Lords. At the end of April, however, in the “wash-up” before parliament was dissolved on May 3rd, the bill became law, and much of the effect of those amendments was lost. What should we note about that process, and where does it leave us? For a week or so it appeared as if the Conservatives had pulled the plug on the Higher Education and Research Bill (HE Bill) by calling a Brexit General Election on June 8th. Only negotiations with the Labour front bench could allow the Bill to become an Act in time for the enforced closure of Parliament. The earlier ‘debate’ in the Commons had been lamentable. No notable amendments were accepted in the Committee stages in the Commons. The Conservatives simply kept to the party whip and refused any amendment. Then the Lords set to work. Through a series of 240 amendments, voted on and accepted in the House of Lords, their Lordships took apart key elements of the legislation. The position taken by the Conservatives in the Commons differed sharply from the position taken by a variety of Lords – Liberal, Labour, Conservative and cross-bencher. The official Tory position on the Bill was expressed in the infamous Green and White Papers. 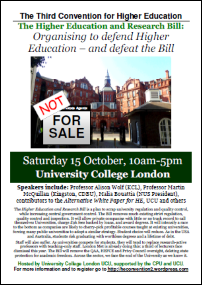 Higher Education ‘reform’ was required to permit private providers to ‘access’ undergraduate students and full fees in competition with universities of long-standing. The UK Government should allow Group 4 or Pearson to compete with Cambridge or Liverpool. The market is king. Private companies must be allowed to enter this market, charge £9,000+ a year, and reap the rewards. As a result ‘standards’ would, miraculously, be raised. To create ‘a level playing field’, the existing regulatory framework, including the Quality Assurance Agency and other bodies, must be disbanded. The standard of academic environment and the inspection regime required by the QAA were too onerous for precious new private providers. Hence the TEF. University teaching was to be evaluated not in terms of whether students were challenged and their minds expanded to the frontiers of human knowledge, but whether the experience of attending university was personally satisfying. The ideas were so poorly constructed that most staff and students who actually read these Papers were perplexed at how little knowledge of education was on display. Absent from the Papers were any notion that education might be about teaching students difficult and challenging ideas, or encouraging them to develop their own ideas. At most, the implied conceptualisation was instrumentalist: spoon-feeding and teaching-to-the-test. We commend the Labour Party for calling for the end of the current £9,000 student tuition fee-and-loans regime – for HE and FE. High tuition fees have been catastrophic for social mobility. They triggered a collapse in part-time study and cut late returners to Higher Education. It is nonsense to claim that the fee regime is ‘progressive’. They are also, paradoxically, more expensive than the previous £3,000 fee. In 2014 the Guardian reported the Treasury admitting that the rate of student debt write-off was predicted to ultimately be over 45%. The high fee was designed for one purpose: to make HE privatisation profitable. David Willets introduced the fee as part of a package of measures: the partial abolition of the ‘block grant’, removal of caps on student numbers, and now – with the appalling Higher Education and Research Act (HE Act) and Teaching Excellence Framework (TEF) – the effective deregulation of the sector. 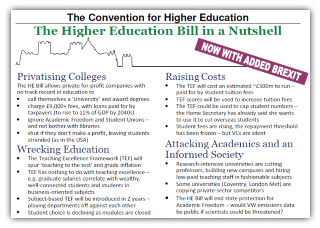 The Conservative aim, outlined in their own Green and White Papers, is to allow companies with little or no track record in education to set up private universities, paid for by the taxpayer through fees and loans, offer ‘degrees’ without oversight, and – if it all goes wrong – shut up shop abandoning students to their fate. We commend Labour for demanding an end to the tuition fee regime, but we call on them to go further. If the Party is serious about rescuing HE in the UK it must commit to repealing the HE Act, and support the reintroduction of rigorous academic standards in the sector.